People with way too much time on their hands may wonder why Beka’s boots feature a zip and three-inch block heels. 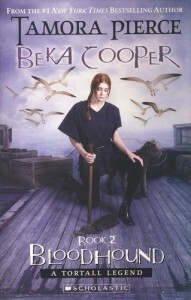 Bloodhound is the second book in the Beka Cooper series by Tamora Pierce. The story follows Beka, now a first-year Dog (aka police officer), as she and her partner Goodwin track down a group of colemongers (aka counterfeiters). Along the way she picks up a scent hound named Achoo, falls in love and saves the day. Bloodhound is written in a journal style. I haven’t read many books in this style but I find it very difficult to believe that someone could recount their day with as much detail as Beka does. Perhaps Pierce should have ditched the journal idea and just made it first person? Beka is the many times great grandmother of George Cooper, a prominent character from The Song of the Lioness series. Generally these types of books, in which characters from previous novels make cameo appearances, drive me batty, but given that there’s a few hundred years between this book and the Alanna series, there wasn’t much chance of that happening. I like how Pierce didn’t make too much of the familiar names (and locations), affording me a pleasant sense of recognition, and didn’t make Sir Lionel of Trebond a carbon-copy of his many times great granddaughter, Alanna. As a writer I want to be like Tamora Pierce. I picked up her first book, Alanna: the first adventure, when I was in primary school and it remains my all-time favourite. As a reluctant reader, there was something about Alanna that fired my imagination and made me want to keep devouring books. If I can do that with my own works-in-progress I will be a very happy author. As a reader I find the brutality of the justice system in Tortall to be disturbing. The use of torture when questioning suspects and the habitual execution of lawbreakers by dropping them in a vat of boiling oil seems to be overkill. Capital punishment is deplorable in any fashion, but do you think that Pierce could have come up with something a little less gruesome than cooking people alive? Or is this Pierce’s way of saying, ‘capital punishment is bad’ without actually saying it? I find it unlikely given that our hero, Beka, has no problems attending the villain’s execution.